If you’re looking to bring the rare color blue into your landscape, it’s hard to find a better specimen than Senecio mandraliscae. Plants may also still be identified by synonyms, Senecio mandraliscae or Kleinia mandraliscae. 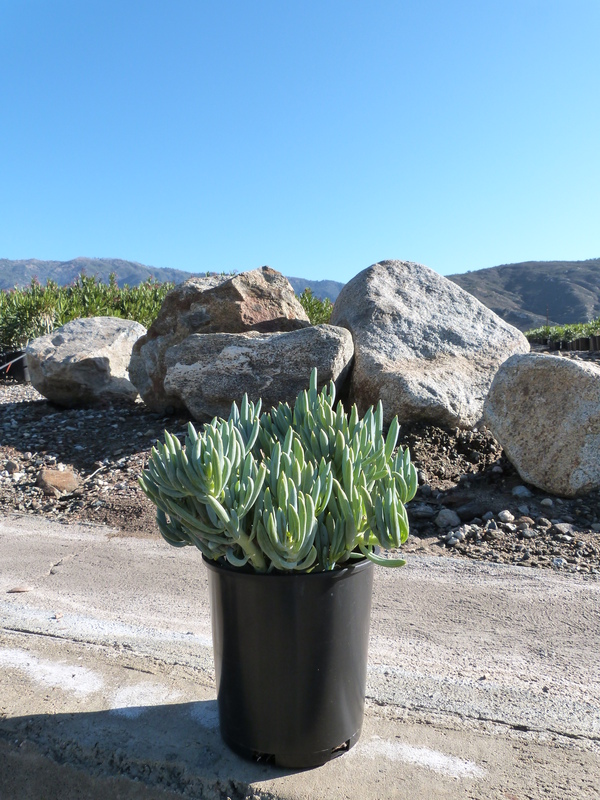 This species of succulent is commonly referred to as blue finger and blue chalk sticks. It’s obvious why once you see it’s curved, upward-pointed leaves. They provide a striking silvery blue color year-round. Plants will grow to form a dense mat, much like a groundcover. They can also be grown very successfully in containers. This South African native is very easy to grow and can thrive under dry, low-irrigation situations. However, plants will grow more quickly when they receive regular irrigation. With regular irrigation you may find that plants spread beyond their intended boundary. Simply tip-prune plants to the desired spread. Plants can produce small white flowers in midsummer. The flowers are not the most attractive feature of the plant and can simply be pruned away at the base if unwanted. Use to create low-maintenance ground cover plantings, mixed succulent plantings or showy containers..